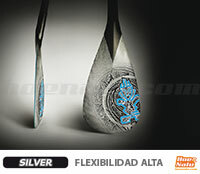 Silver technology grants this paddle with great flexibility (HIGH FLEX) for an exit with extra strength. The paddle is made of a very light PVC core with ABS edges for better impact resistance. The carbon central rod offers a strong conection between the paddle and the grip. Carbon BX technology is a favorite of lightweight riders because of its extra flex. Paddle with PVC core covered in fiber and carbon.